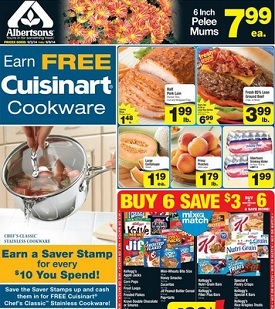 This week Albertsons online ad sales valid September 03 – September 09, 2014: 2/$11 Baby Basics Jumbo Pack Diapers or Basics Kids Training Pants 12-50 ct. or Baby Wipes 320 ct.
; $4.99 Father Table Cheesecakes; 2/$6 King’s Hawaiian Hamburger or Hot Dog Buns; $2.99 Sliced Loaf Cakes; $7.99 Boost or Glucerna Shakes; $1.79 Kool-Aid Jammers 10 Pack, Essential Everyday Apple Juice 64 oz. ; 2/$3 TruMoo Protein Milk; 3/$5 Red Gold Tomatoes 28 oz. or Ortega Taco Shells 12 ct.; $.59 Yakisoba or Maruchan Bowls; $6.99 Downy Unstoppables; 2/$3 Kraft Salad Dressing; $2.99 Borden American Singles; $4.99 Fresh Made Super Food Kale Salad or Crunchy Veggie Salad; $4.99 Fast Fixin’ Breaded Chicken Strips or Nuggets; 2/$5 Tai Pei Entrées 12-14 oz., Herdez Bowls 10 oz. or New York Texas Toast 10-11 oz. ; 2/$6 Crest Toothpaste 4-8 oz., Glide Floss 27.3-54.7 Yd. or Picks 30-75 ct. or Equaline Mouth Rinse 50.7 oz. ; B1G1 Sundown, Nature Made, Disney Gummies or Osteo Bi-Flex Vitamins, Minerals or Supplements; $2.49 Essential Everyday Sugar 4 lb. or Liquid Sucralose Sweetener 1.68 oz. ; $3.49 Essential Everyday Vegetable Oil; $4.99 Boneless Beef for Stew; $2.99 Butterball Turkey Bacon or Sausage; $3.98 Baby Back or St. Louis Style Pork Ribs; $8.99 Cooked EZ Peel Shrimp; $4.99 Fresh Catfish Fillets; $3.99 Owens Roll Sausage; $8.99 Charmin Bath Tissue; 2/$6 Tidy Cats Cat Litter; $1.49 Chilean Navel Oranges; $2.99 California Strawberries; $.99 Hass Avocados; 3/$10 Healthy Lunch Options; $2.49 Frito Lay Tostitos; and more.